What are cold therapy devices (cryotherapy) and pain pumps, and are they necessary for surgery? These devices can help decrease pain, swelling, and inflammation after surgery. Even without the devices, you will have numbing medication injected at the end of surgery which typically lasts 3-5 hours; this will give you enough time to return home and start taking your oral pain medications. The cold therapy devices are sterile pads incorporated into the post-operative dressings; the pads are attached by rubber tubing to motorized “igloos” which circulate ice-cold water through the pads. This is a controlled method of applying ice to a post-operative wound. One can use a frozen bag of peas or corn kernels as well, but the penetration through the dressing may not be that high, and care must be taken to not get the dressings wet. The cold therapy devices may continue to be used for weeks after the surgery such as after physical therapy appointments. The pain pumps are automated devices that infuse numbing medication (like novocaine) into the wound via a small catheter. These usually last for 2 days and are removed in the office on your first post-operative visit. The catheters are small as to not need a suture for closure. Both of these devices may not be covered by many insurances, especially HMOs. Cash quotes from suppliers we use may be obtained by calling Sean Smith of HUB Medical at (866) 438 3868. What occurs in my pre-operative visit? Discussion with physician about the procedure, risks and benefits, prognosis, and other options. Labwork if indicated, which may include bloodwork, EKG, urine testing. Consult with anesthesiologist – this will occur on the operative day unless you have a history of anesthetic complications. Most anesthesia is general (you are asleep) and may be supplemented with regional anesthesia (a nerve injection) for post-operative comfort. Confirmation of post-operative cold therapy or pain pump usage. Discussion of post-operative physical therapy (instructs you on exercises and crutch ambulating and may fit you with a knee brace). When and how will my surgery be scheduled? Changes in your general health will affect your surgery. If at anytime prior to your surgery any of the following conditions develop, please notify your physician. Do not eat or drink anything after midnight unless otherwise instructed by your physician or the anesthesiologist. Your surgery may be canceled if you eat or drink after midnight or as instructed. Take routine medications only as directed by your anesthesiologist or physician. Leave all jewelry, money, watches and valuables with family. The hospital can not be responsible for your valuables. Wear comfortable casual clothing that is easy to get on and off (drawstring-style sweat pants, boxer-style shorts, or loose clothing), and large enough to accommodate a large dressing. Button-top shirts that can be draped over your shoulder are usually best for shoulder surgery, as you may not be able to easily put your arm through a sleeve after surgery. Post-operative braces or cold therapy devices delivered to you by a vendor please bring the day of surgery. You may wish to bring reading material or crossword puzzles to occupy your time while you are in the hospital. Arrange to have an adult (someone over 18) available to drive you home after discharge, and have someone stay with you at least 24 hours once you are home. You will not be allowed to leave the hospital alone. You will be notified the day before surgery by phone the exact time to arrive on the day of surgery. In general, you must arrive 1 hour before your scheduled surgery time. Check in where you were directed on your pre-operative visit at least 1 hour prior to your operative time. You will be asked to change into a hospital gown, remove jewelry and contacts. (We suggest you leave your contacts out the day of surgery.) The nurses will check your (pulse, blood pressure and temperature), and ask you a few questions. Once this is completed you will be directed to a waiting area until the operating room notifies the nurses. You will then be taken to the operating room on a cart. The anesthesiologist talks with you briefly, an IV (needle inserted to give you fluids) is inserted, and final preparations are carried out. Your family will be directed to waiting rooms. Medical staff will notify them when your procedure is completed, and how you are doing. They will be directed to the appropriate area once you have completed your recovery room stay. When surgery is completed, you will be taken to the recovery room. The usual length of stay in the recovery room is 1 hour, but may be longer according to the surgical procedure and the type of anesthesia. While you are in the recovery room, the nurses will be checking your blood pressure, pulse, respirations, and temperature frequently. They will also be checking the sensation and circulation in your surgical leg. You may have a large bandage, a brace or an ice cuff on your knee. After your stay in the recovery room you will be transferred to same an outpatient observation unit where staff During this final recovery stage your nurses review homegoing instructions, obtain prescriptions, and you may be seen by a physical therapist. Discharge is based upon your recovery from the effects of anesthesia, and if your pain is under control. Your physician determines if you are ready for discharge. If additional observation is required, you may be admitted to the hospital. It is normal to feel drowsy for 24-48 hours after surgery and to require pain medication at regular intervals. These symptoms will gradually subside and each day you will feel less sleepy and painful. Crutches are used for a short time. It often takes anywhere from 1-3 wks for swelling to resolve. During this time we’d like you to use crutches as a precaution, or at least one crutch on the opposite side for 1 week. 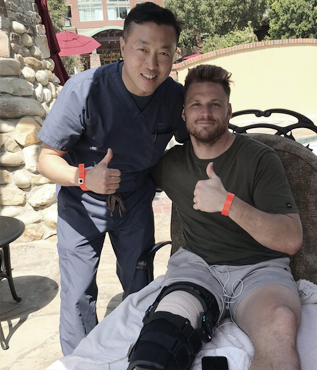 ** Meniscus Repair patients – I typically will limit your weightbearing to 50% for 3 weeks, and have you use a knee immobilizer for ambulation for the first 3 weeks. I also limit the degree of knee flexion; I will be giving these instructions to your physical therapist. 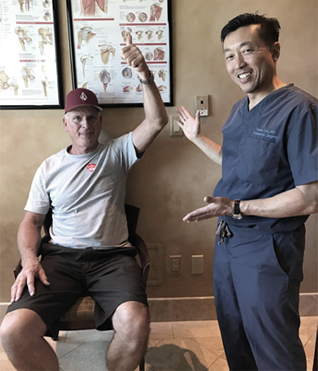 ** Cartilage Repair patients – You will typically be non-weightbearing for the first 4-6 weeks pending healing of your joint. When standing, you may set your foot down, but do not place any weight on it while walking. ** ACL patients – use your hinged knee brace at all times for 6 wks while ambulating. You may remove the brace to place your knee in the CPM machine. Shoulder patients – it is typically more comfortable for the first 1-2 wks to sleep in a recliner-type chair with pillows supporting the shoulder. Keep the shoulder brace on at all times unless instructed. For 3 times a day one may remove the sling portion to straighten the elbow to prevent stiffness, but do not attempt to move or elevate the arm more than 30 degrees away from your side. You may use your wrist and hand as much as you’d like for light activities at the waist level, or reachable with elbow flexion. You should not attempt to lift anything heavier than a can of soda. ** I feel it is appropriate to remind you that although the external incisions are quite small, you have nonetheless had a major operative procedure within your joint. Scientific research has shown that shoulder rotator cuff or labral healing takes at least 6-8 weeks, and complete ACL healing can take 10-12 months. 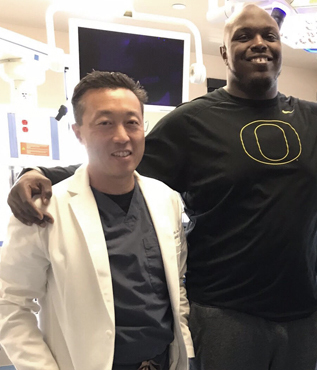 Complete healing and recovery will take several months; a graduated rehabilitation program specific to your surgery will be initiated after your first post-operative visit. I will supervise and modify this program as necessary, based upon your individual rate of healing and recovery. If this is ordered for you (typically ACL patients or Shoulder stiffness patients), it will be delivered usually the day after surgery. The company representative will give instructions on operation of the device. You may place your knee or arm in the device (remove post-operative brace gently) for 4-6 hours a day. Knee flexion can begin at 0-60 degrees. Shoulder elevation can begin at 0-75 degrees. Both can be increased as tolerable, 5-10 degrees/day. You will typically use this device for 4 weeks post-op. The bandage applied to your incisions may become moist or bloodstained, however this is normal and results from fluid (water) placed in the joint during surgery. Change any bandage immediately if it becomes wet or bloody. Knee arthroscopy and shoulder arthroscopy – you may remove the dressings after 3 days and apply neosporine or other antibiotic ointment to the incisions and apply bandaids or sterile dressings to keep the wounds covered. If all the incisions are arthroscopic (one suture) you may shower after 3 days, but do not use a bath, Jacuzzi, or pool for 3 weeks. Re-apply dressings/bandaids after showering. If I made an “open” incision (more than one suture) keep dry for 2 weeks, or otherwise instructed. ACL patients – keep the wound dry for 2 weeks post-op. For patients with pain pumps (see below), I typically have to return to the office 2 days after surgery to do the first dressing change and to remove the pain pump. Applying ice or using the Cold Therapy device (see below) for the first 24-48 hours after surgery will reduce pain and swelling. You may also use Advil or Naprosyn over the counter for the first 3-5 days after surgery to supplement the above medications for pain. The Pain Pump (if used) will automatically infuse numbing medication; most devices have a button or bulb to depress that gives an extra bolus of medication. Elevating your extremity above heart level as much as possible will also reduce pain and swelling. Elevate your extremity after exercises and always at night, with your extremity above heart level. Take pain medication as prescribed. Do not drink alcohol when you are taking this medication. Take medication 30 minutes before exercises. Eventually pain subsides and Tylenol should control your pain. While these devices may be used for prolonged periods after surgery to control pain and swelling, it is typically good to turn the device off for 20 minutes and allow the knee or shoulder to “warm up” every 3 hours. If at any time there is increased tingling or numbness in the extremity while the cold device is on, or if there is a burning sensation or significant pain with the device on, you must turn off the device and call our office. If your right leg is operated on, or your shoulder, you will not be safe to drive for probably 4 weeks post-op. Depending on the type of surgery, if more healing-time is required for strenuous activities (i.e. ACL, rotator cuff repair, knee replacement) safe driving may not be allowed till 6 weeks post-op. Physical therapy will begin after your first post-operative visit. I will direct and modify your program based on your progress. Two commonly used exercises that you may begin immediately after surgery are quadriceps setting and straight leg raises. The swelling in your knee after surgery causes “inhibition” of the quadriceps (thigh) muscle from “working”. These exercises are designed to “re-activate” the quads – the sooner you regain the ability to contract and control these muscles, the sooner you will be able to wean yourself from crutches (provided there are no weight-bearing limitations). Lie on your back with your knees straight, legs flat and arms by your side. Place your heel/lower calf area on a towel roll or soft chair so that the area behind your knee issuspended. Tighten the muscles on the top of the thigh (quadriceps), and at the same time push the back of the knee down and hold for 5 seconds. Increase the time you hold this contraction up to 15 seconds, then you can attempt to raise the heel. Hold for 5 seconds, relax 5 seconds. Repeat this exercise 6 times on a firm surface at least 4 times a day. This exercise is as an extension of the quadriceps set above, and can be accomplished only after being able to hold a quadriceps set for at least 15-20 seconds with your heel on a towel roll. Lie on your back with your operative knee flat and straight. Keep the other leg bent with foot flat on the floor. Slowly raise your operative leg about 6 inches off the floor, keeping the leg as straight as you can. Hold for a count of 5 seconds, then lower the leg. Repeat this exercise 6 times on a firm surface at least 4 times a day. The goal is to be able to contract your quadriceps muscle then lift your leg straight in the air and hold for 10 seconds. Ultimately you want to increase your endurance to 30 seconds. The sooner you regain your quadriceps strength and control by doing these excercises, the sooner you will be able to ambulate without crutches and weakness. Shoulder Repair : (i.e. rotator cuff repair, labral repair, capsulolabral reconstruction, SLAP repair) will remain in a sling device for 3-4 weeks. During this time you may use your hand, wrist, and elbow for activities at the waist or table level. You may gently remove the brace 3 times a day to straighten your elbow out, otherwise, you must remain in the brace all times, including sleep. This brace helps protect the repair and ensure proper healing. Do not attempt to lift or elevate the arm more than 30 degrees from the side of your body. You may also squeeze a ball with your hand or squeeze your shoulder blades together and hold for 10 seconds, 3x/day. Physical therapy starts at 3-4 weeks under my direction, and typically involves assisted range of motion and gentle strengthening exercises for the next 3-5 wks. Do not attempt any exercises on your own without direction/clearance from the physical therapist or myself. See “Active Assisted” program below for safe home exercises, once you’ve reached this stage. Active Assisted Range of Motion Program: The goal in this phase is to regain motion without over-stressing tissues (rotator cuff and labrum) that are still healing. (it takes 6-8 wks to fully heal). Shoulder blade shrugs and scapular squeeze – hold each position for 15 seconds, perform for 10 minutes, 5 times a day. Wall Slides/Climb – similar to Table Slides but performed vertically on a wall. Do not attempt until you are comfortable with Table Slides. Clasped Hands Elevation – clasp your hands together, sit in a reclined chair or lie down, use your non-operated arm to lift the other over your head. Work towards the position of placing your hands behind your head. Once this is achieved, you can bring your elbow tips together and feel the “back” of your shoulder stretch, and spread your elbow tips apart to feel the “front” of your shoulder stretch. Ultimately, you can twist your palms upward and push both arms over your head to complete your motion. Follow-up visits are necessary for your doctor to chart progress, change bandages, check for any complications and evaluate your rehabilitation progress. Pain Pump patients typically follow up 2 days after surgery. Without no pain pump, you may follow up 7-10 days after surgery. Chills or temperature above 38.5° C (101.3° F). or if greater than 38° C (100.4° F) for 24 hours. Bright red blood that does not stop and/or is soaking the dressing.